Tomuri Male Fuzzy Kiwi (actinidia deliciousa "Tomuri") - Delicious egg shaped fruit commonly available in grocery stores are very sweet and contain high amounts of vitamin C and other antioxidants. "Tomuri" is the male pollinator needed for Vincent to produce fruit. One Tomuri male can pollinate up to 8 Vincent females. 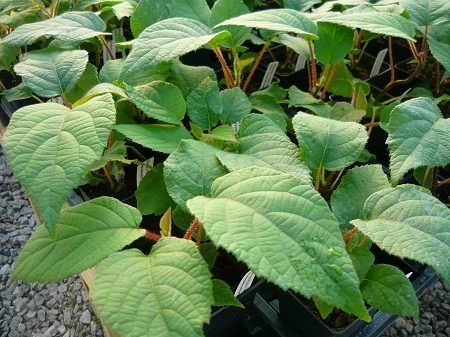 Fuzzy kiwi are easy to grow in temperate climates, not fussy about soils, though they do prefer a well drained location and not to sit in wet soils. Vines can reach 30' or longer and will need a ssupportive trellis. Very heat tolerant and cold hardy to about 15 degrees once established. Fuzzy kiwi require 150 -300 chill hours to fruit. Perennial zones 8-9. Live starter plant in 3 inch container.